Cedar Grove junior Noah Kuranga taking an approach shot during the DCSD Golf Championships. Cedar Grove senior Noah Kuranga shot a one over par 73 to capture fourth in the Class 3A boys’ state golf tournament at Gordon Lakes Golf Club in Fort Gordon on Monday. He finished five strokes behind co-medalists Keller Harper of Westminster and Zac Thornton of Pierce County who both shot four-under par 68s on the day. Kuranga topped a season in which he finished second in the DeKalb County Championships in sudden death playoff for the second consecutive season and was runner-up in the Region 4-3A Championships. The Lakeside Vikings finished in a tie for 15th with Newnan in the Class 6A boys’ state golf tournament at Spring Hill Country Club in Tifton on Monday. The Vikings shot a team score of 342 led by Drew Smith with an 80 which tied him for 42nd overall in the tournament field. Zach Garlow shot an 83 (tied for 59th) and Tony Bryant finished with an 89 (tied for 81st). The Dunwoody Wildcats compiled a team score of 319 to tie for 13th with Creekview in the Class 5A boys’ state golf tournament at Bartram Trail Golf Club in Evans on Monday. Davis Brainerd finished 11 strokes behind medalist Nolan Miller of Columbus with a five-over par 77 to tie for 31st in the field. Patrick Caiaccio followed one stroke back with a 78 to tie for 42nd. Dunwoody’s Lauren Callahan put together a round of 90 on the course at West Lake Country Club in Augusta to finish in a tie for 29th. Callahan, the DeKalb County girls’ runner-up, qualified as the Region 6-5A medalist. Chamblee freshman Tiffany Li represented the Lady Bulldogs in the Class 4A girls’ state tournament at Waynesboro Golf Club in Waynesboro on Monday. 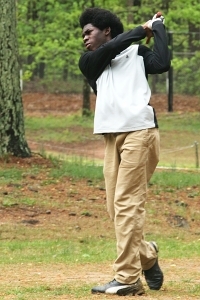 Li, the third place finisher in DeKalb County, shot a round of 110 to finish 53rd overall in the state tournament.